This topic contains 5 replies, has 3 voices, and was last updated by Christina Chester 4 years, 9 months ago. Many historic observatory domes had windows, but I’m not aware of any post-WW2 observatories with this design… an interesting little research project for somebody! I’ve been digging online but I’ve yet to find a definitive and qualified answer as to why observatories included windows in their architecture pre WW2. With regards to the ones at the ROG, I wonder if their inclusion was purely for aesthetic reasons, certainly in the South Building? There was a revival of English Baroque architecture (I believe known as Queen Anne Style) during the period that the South Building was built though I think this style would have been going out of fashion by the time the build was complete. This revival would have meant that the style was in keeping to that of Christopher Wren’s Flamsteed House, built during the period of English Baroque architecture. English Baroque architecture “was characterized by new explorations of form, light and shadow and dramatic intensity,” according to a Wikipedia article on the subject which then goes on to reference “uniform lighting by means of several windows.” This is definitely visible within the South Building’s design however, it doesn’t explain why an observatory would be built with windows. Actually, there’s lots of really interesting stuff on his site – I’m still reading it! He mentions that “To emphasize the nautical connections, Crisp lit the inside of the dome with a series of circular windows reminiscent of the portholes on a ship”. So there, this goes back to my initial thought that windows were included for aesthetic purposes. There was less light pollution at Greenwich at the time of construction of the domes. Windows would have allowed scientists working there to get on with their work durning the day and they didn’t need to worry about light obscuring views at night so windows were not problematic. Simple… Perhaps too simple… But that’s my theory. Thanks Christina, a fascinating post. Thanks also for the link to the Graham Dolan website… that looks like a great resource. Graham has done lots of stuff with the Flamsteed in the past, including a “behind the scenes” tour of the South Building back in 2004. He also lectured to the society in 2006. I think your theory has a number of merits. Of course, when the observatory was first built, there would have been no light pollution, but this clearly worsened over time. I suspect the breaking point would have been when photographic plates started being taken. Any stray light would then have been a major problem, as a long exposure could have been ruined in a fraction of a second by any stray light. 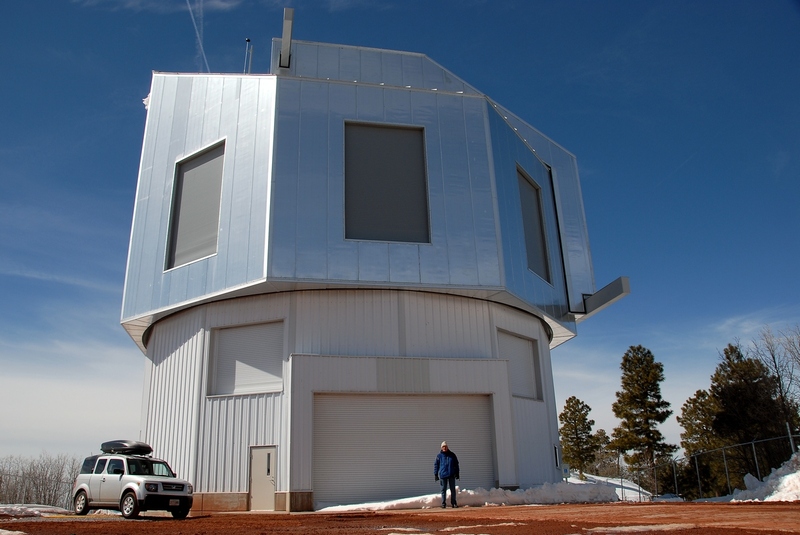 When constructing new observatories, why build windows? Windows would only add to the cost and were not necessary, particularly as the domes could be lit by electric lights in the daytime. However, I’ve done a little more research myself since your post. Of course, the biggest disadvantage of observatory domes is that they trap warm air, thereby creating turbulent air currents when they are opened. We’ve witnessed this ourselves with the Great Equatorial Telescope… when the dome is opened, all of the hot air inside rushes out and makes the image wobble about all over the place. If you had an open structure, with windows(! ), the dome would take much less time to come to thermal equilibrium with the outside temperature. However, using glass in the windows would probably cause the dome to heat even more during the daytime, so the best sort of window would be a simple shutter. Clearly, in these locations, astronomers don’t need to worry about light pollution, and a strict ban on lights should mean that stray lights won’t be a problem with any photographic exposures. So, perhaps the designers of the old observatories had the right idea after all!! What a fantastic website! I was never aware of http://www.thegreenwichmeridian.org, just http://www.rmg.co.uk. The tools that lets you see where the meridian markers are is pretty cool! I noticed that the northernmost marker in England is beside a tiny seaside hamlet called Tunstall, near Hull. Which reminded me of KT Tunstall, the Scottish singer who made an album called Eye to the Telescope and shared a passion for astronomy with her late father, Dr David Tunstall, a physics lecturer at St Andrews. Graham’s site is great isn’t it! I can imagine his tour and lecture would have been very interesting too. Certainly knows his stuff! ..And the Meridian Map… I hadn’t even looked at that! You must be a big KT Tunstall fan Andy! I was intrigued by this piece of astro music trivia so I looked her album up. Building upon what you’ve already said, “the name of the album, which was released in the UK in late 2004, was inspired by KT’s childhood visits with her adoptive father to his university’s observatory.” So there you go! Mike, yes, your thoughts about observatory ventilation are probably right on the mark. I’ve tracked down the building plans for the Great Equatorial building. I was hoping that there would be a clue there but still, nothing definitive. The initial lighting installed was gas so I’m guessing that this too would have added to the heat being generated in the room (all the more reason for needing windows and supports your theory). Interesting also that this would have also been problematic to astronomers working there: “The filar variety of micrometer suffers from the need to illuminate the wires, or the field, and this reduces the magnitude threshold of the telescope. The 12.8-inch refractor used an elaborate system of gas jets to provide illumination.” p.564, ‘The 28-inch Refractor at Greenwich – a History of Two Telescopes‘ by D.C. Wright. I’ll confess, I’m not entirely sure what part of the telescope is being referenced here… But it interests me none the less. This is referring to a Filar Micrometer, used on large refractor telescopes, which allows measurements of the angle and distance between two stars that are close together. Generally, these micrometers need some form of illumination so that you can see the cross-hairs, but clearly, by adding illumination, you are potentially reducing the magnitude of stars that you would be able to view. I see. Thanks for clarifying Mike! Moon-Saturn conjunction and the ultimate answer to the ultimate question…. Anyone know what this might be?